SIESTA KEY, Fla. — Tampa Bay area beaches are looking much better this weekend as tropical storm Gordon helped push the red tide away from the shores. 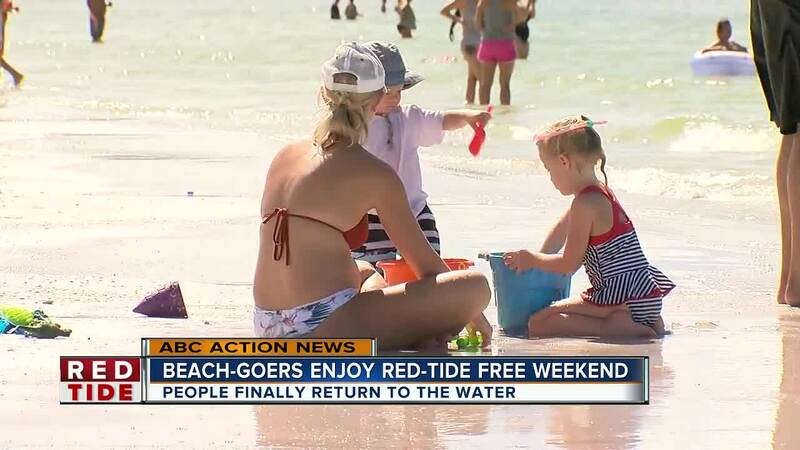 At Siesta Key Beach, people are able to enjoy the sand, the sun and, for the first time in a while, the water this weekend. "It’s not nearly as murky, the water. And there are actual small fish in there, there’s actual life, so that was nice to see," said Linda Ferguson who loves the beach. For weeks, death littered the shoreline keeping people like Jamie Kennedy far away. "It was horrible. You couldn’t breathe, there was fish kill everywhere. The temperature was great but it was just coughing galore," said Kennedy. It was so bad that many people left the area. "I’m the only one in my building practically, and I live across the street," said Dennis Gottschalk who has been coming to Siesta Key for 38 years. But the FWC says tropical storm Gordon helped pull the red tide Northwest, away from bay area shores. Giving some relief to families like Corey Curyto’s, who says he researched online about the toxin levels before deciding to bring his wife and four kids to Siesta Key Beach. "Actually it was funny because when I pulled up I was happy to see a bunch of cars," said Curyto. While many are enjoying the beautiful break from red tide, others want something done to help fix it. "This isn’t natural, the sign says it's a natural event, no its not. California wildfires are a natural event but if you throw gas on it the natural aspect kind of wins," said Gottschalk.